Quality | UNEKO spol. s r. o. Thorough compliance with verified production processes and permanent intra-operationcontrol gives our aluminium castings the required level of quality. Without the responsible approach of our employees and excellent technological preparation of production it would not be possible to produce such exact and complex castings from aluminium alloys to be used and assembled in the most demanding applications of many industrial sectors. A maximum guarantee of quality of all in our provided services and supplied products is ensured by the fact our quality management department reports directly to company management and the by the introduction of an ČSN EN ISO 9001:2016 certified quality management system. Our machined aluminium castings are required to satisfy the strictest quality criteria. For this reason we have introduced in production a quality control plan for individual technological operations and an ČSN EN ISO 9001:2016 quality management system. These planned control mechanisms enable us to permanently satisfy the demanding requirements of customers and design engineers. We check measurements and do interim testing in production through verified processes using standard measuring devices and special analytical instruments. The results of these measurements and analyses are recorded as needed into measurement and testing reports. These are filed and most are included in supplier declarations on conformity. We use metallurgical raw materials only from verified suppliers. Material deliveries include attestation of chemical composition. Nonetheless, we regularly check an alloy in the furnaces. 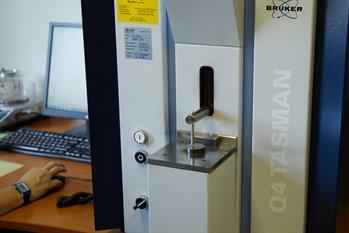 To control the chemical composition of an alloy we use a High-End CCD optical emissions (OES) spectrometer Q4 TASMAN from German manufacturer Bruker-Elemental. We determine the melt gassing index of metal (D-index) using a Martech – VTCM 0017 laboratory machine. We establish mechanical values in a “tearing test” done at outside accredited laboratories. We measure the hardness of a material with a Impact TH 170 hardness tester. Before and during formation we check the status of the pattern. Its completeness and shape determines future quality dimensions of quality for the casting. 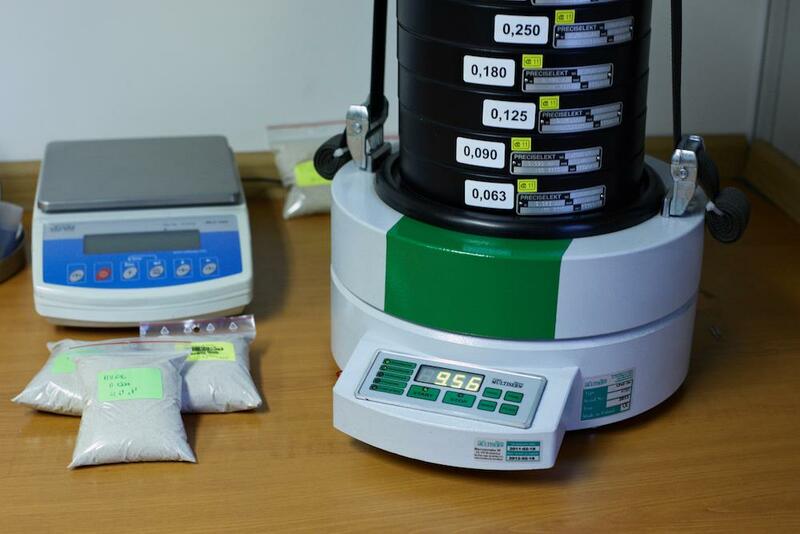 We further conduct granulometric analysis of the foundry sand, determining the hardness of the moulds and the content of combustible substances in the moulding mixture. These important indicators have a great impact on the quality of the foundry moulds and therefore subsequently on the shape, quality and size of the casting. An unrefined or machined casting may also show various surface and internal defects in the material despite all measures taken in production. 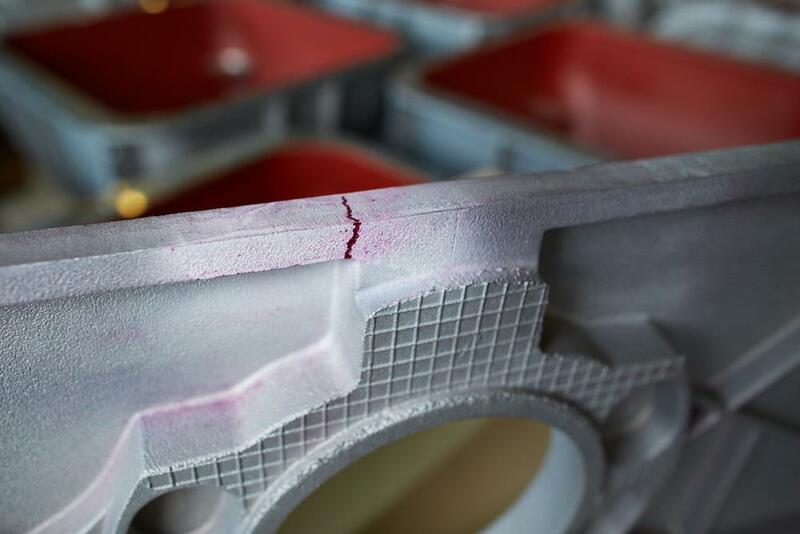 These unwanted material defects threaten safety during operation and limit the lifespan of machines and equipment. In order to avoid these complications, we perform a series of prescribed tests. The capillary test is ranked among the oldest defectoscopic methods. This non-destructive test simply identifies pores and cracks in the surface of the material in unrefined or machined casting. An Ultrasound test (UT) is among the most common non-destructive methods to find interior faults, tears and cold joints. UT is also used to verify wall thickness and any independent volume defects in material without the casting becoming damaged. The X-ray test (radiography) is a non-destructive test that checks the casting for the occurrence of interior defects in the material over the entire volume of the casting. Either an X-ray lamp or a radioactive isotope is used to x-ray the material. A digital record of the X-ray test enables immediate evaluation. Pressure testing of castings for exterior impermeability is performed if a customer requiring pressure-sealed castings agrees to it. Either water or air is used as the testing medium in the prescribed pressure test. Pressure is tested with water at more than 50 bars. Pressure is tested with air up to 8 bar. When casting is pressure tested with air, it is submerged in water for an exact determination of possible leaks in pressure and the material’s porosity. 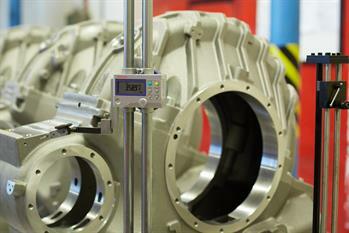 A helium test, the “helium leak test” checks castings to be used for the most demanding casting applications. This method verifies the impermeability of castings with helium and air. 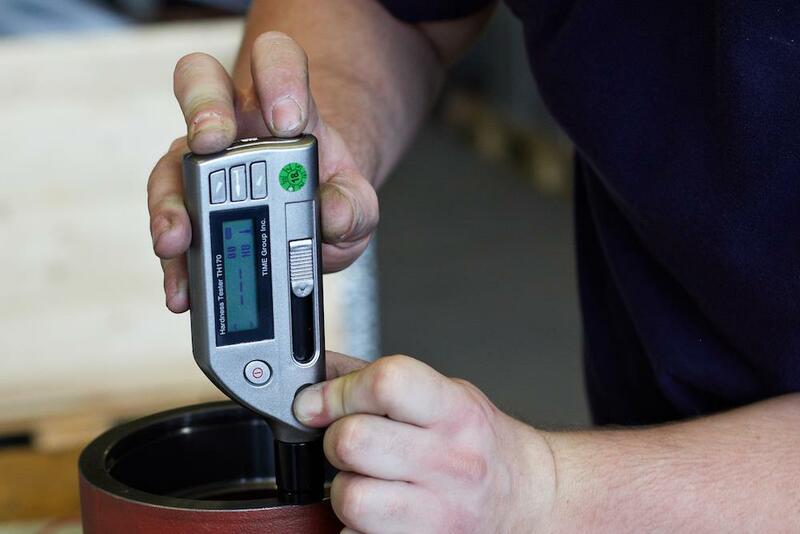 An analytical Inficon UL 1000 spectrometer determines the concentration of a helium-air mixture compared with the required customer-set value. This test reveals impermeabilities that cannot be technically found with the earlier mentioned testing methods. Mechanical tests of the casting material and the results of these tests are very important in order to thoroughly assess the quality of castings. The tensile strength and hardness of the material are characteristics which impact the lifespan of the configurations, appliances and tools assembled with our castings are used. A tensile test is a standard test of the load capacity of a material when pulled. The sample is tested in a special tearing device, namely the VEB WPM Rauenstein. The tensile test produces a diagram where deductions can be made from a whole line of values such as the tensile strength(Rm), yield strength (Re), tensibility (A) and contraction (Z). Test parameters for metals and the sizes of the tested samples are provided in ČSN EN ISO 6892. The hardness test of metals has a major impact on the resistance of a material against wear and tear and also influences the lifespan of castings. 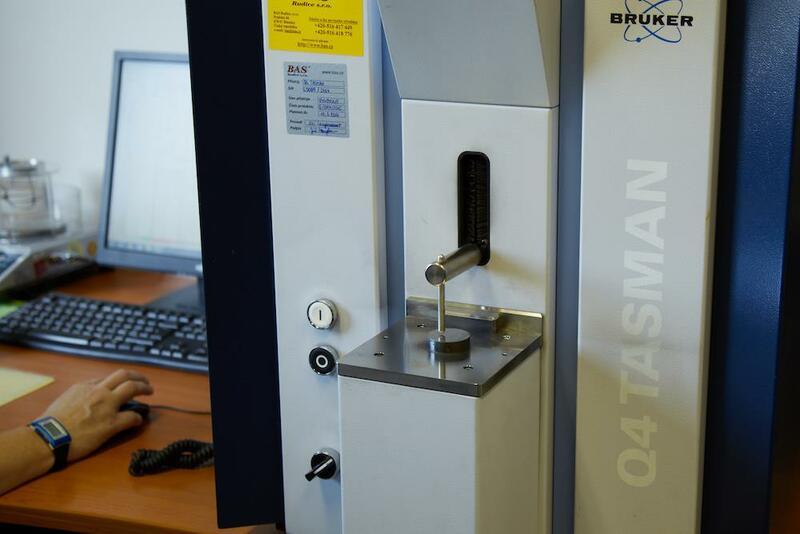 The hardness of a casting is determined with an Impact TH 170 hardness tester using the Brinell, Rockwell or Vickers testing methods. We check the dimensions and basic geometric characteristics of castings and machined parts, including intra-operational phases, in a standard metrological environment using calibrated measuring devices. We perform CMM 3D measuring of standardly non-measurable dimensions and geometric quantities currently with verified contracted partners. They are equipped with Hexagon (DEA) or Wenzel brand coordinate machines. At your request, whenever UNEKO measures and tests, afterward a Measurement Report, Declaration of Conformity, Certification of Quality and/or an Inspection certificate 2.2 and 3.1 will be drafted. These documents also allow us to look backward at the inspection and measurement results from the specific part.